One of my favorite foods is a really hearty curry dish and while we have a couple of great Thai places to order from, we’ve been into making our own. It’s nice to be able to control the amount of oil, salt and sugar that go into your meals. 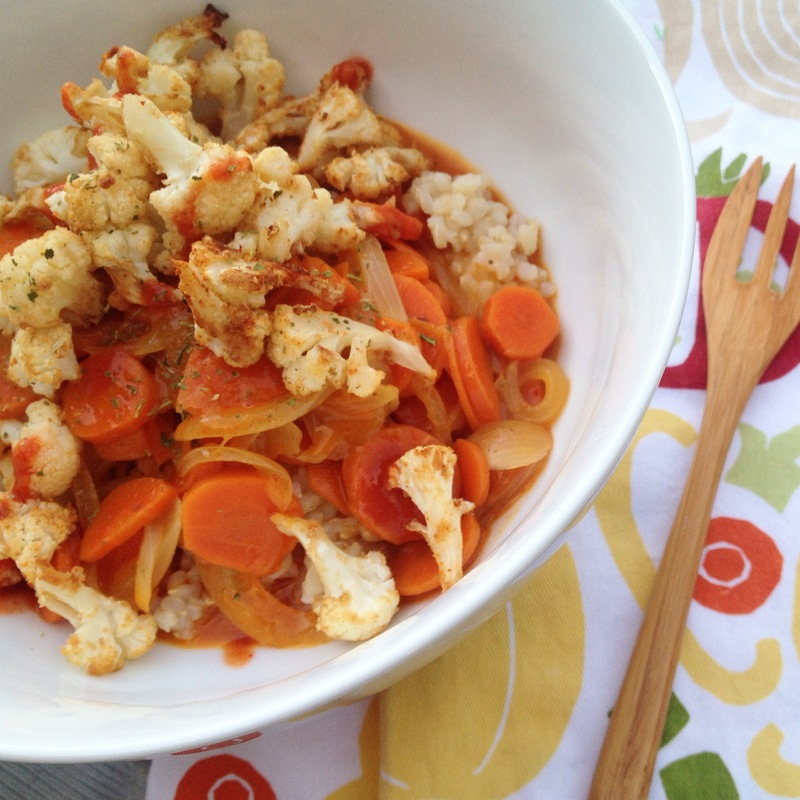 This time around I added in some roasted cauliflower, but broccoli or squash work great, too! Rinse rice and cook accordingly. We used the brown rice setting on our rice cooker and added one veggie bouillon cube for extra flavor. While your rice is cooking, wash and chop your cauliflower into small florets. Pat dry and add it to a large bowl with seasonings of your choice. I used 3 TBSP nutritional yeast, 1 tsp each of paprika, onion powder & garlic powder and a pinch of Himalayan sea salt. You can adjust as needed for your taste preference. Mix well until evenly coated. Spread the cauliflower on a parchment paper lined baking sheet(s) in a nice single layer. Bake for 45 minutes or until tender and slightly crisp. You’ll want to flip/mix the cauliflower around halfway through. While your cauliflower is roasting, heat 2 TBSP of water in a pan on medium heat. We use stainless steel cookware, but if you’re using non-stick, you can use less water. Add in your onions and cook until tender, approx. 8 minutes. Use more water, if needed, to prevent sticking. *For even more flavor, you can use veggie broth in place of water. Once the onions are tender, add your chopped carrots to the pan and additional water, if needed. Sauté for 4-5 minutes. Next add in the red curry paste, coconut sugar and coconut milk. Bring to a boil, cover and reduce heat to low. Stir occasionally – cook for at least 8-10 minutes. To build your curry bowl, first add the rice, top with red coconut curry “sauce” and then add in the roasted cauliflower. Top with your choice of additional seasonings or hot sauce. **I kept this recipe on the mild side, in hopes that Willow would try it, but she declined. 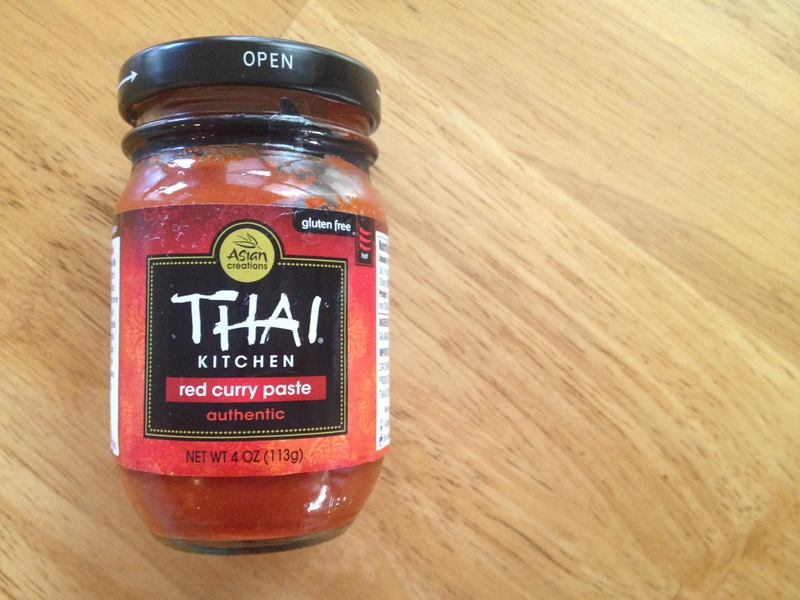 You can add more curry paste to increase the spice level or even some cayenne or chipotle powder. I make a chickpea dish using that exact same curry paste, I love that stuff! I love the ingredients you chose so much and maybe this would even be good over rice, or my favorite, potatoes! !